Stargazers are about to get their annual celestial treat: A bright meteor shower, the Geminids, will grace skies worldwide this week, with a peak in activity on Thursday (Dec. 13). No telescope or binoculars are required to see the show — just use your bare eyes. The moon will set before the meteors come out to play around 10 p.m. local time, meaning the sky should be nice and dark for optimal viewing. There could be as many as 100 to 150 meteors an hour to gape at, for those patient enough to spend a few hours in a dark area and let their eyes adapt to starlight. The Geminids, unusually among meteor showers, are the leftovers of an asteroid (most showers originate with comets). They are caused when rubble from the asteroid hits Earth's atmosphere, lighting a path through the sky as it burns up. "It makes them stronger. They can survive lower in the atmosphere," said Cooke, the lead for NASA's Meteoroid Environments Office at the Marshall Space Flight Center in Huntsville, Ala.
A typical Geminid particle, he said, is about 1/25 of an inch (1 millimeter) in size and can survive as low as 35 miles in altitude. Yet the full story of how these particles came to be is shrouded in mystery. 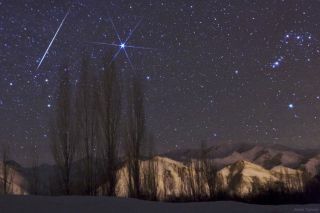 For skywatchers looking up, the Geminids appear to emanate from a point in the sky in the constellation Gemini. But more properly, the origins of this shower come from the debris of an asteroidcalled 3200 Phaethon. As Earth runs into the debris stream during the planet's orbit around the sun, some of the particles burn up in Earth's atmosphere. A stream of dust broke off this 3-mile-wide (4.8 kilometers) asteroid several centuries ago, likely from a collision with another space rock, Cooke said. The stream remained in space for centuries, out of the firing range of Earth's orbit. Then, around the 1830s, the gravity of Jupiter, which shifted the stream over the centuries, perturbed the rocky stream enough that the Earth ran into it. More disturbances from Jupiter have pushed the stream closer to Earth, resulting in more meteors. The collision theory is one of several hypotheses for the Geminids' beginnings. Some astronomers say the stream began when Phaethon broke off from the asteroid Pallas, but the orbits of the meteoroid particles don't neatly fit with the theory. The term "meteoroid" refers to rocks in space that have not entered Earth's atmosphere. When they hit the atmosphere in a blaze of light, they're referred to as "meteors," then "meteorites" if they reach the ground. Another hypothesis: Phaethon sheds debris when it gets close to the sun in its orbit, and is blasted by the sun's heat. Observations from NASA's twin STEREO spacecraftgave credence to the idea in 2009, but the amount of dust seen was not enough to keep the stream replenished over time. Regardless of the Geminids' origins, Cooke said the single biggest threat to the shower is not the amount of dust, but its orbit. If Jupiter's gravity interferes with the stream in a certain way, it's possible the debris could be diverted away from Earth. But that's not expected to happen any time soon, Cooke added. Cooke said Twitter, Facebook and other forms of social media are making the public more aware of when meteor showers occur. Also, television and other mainstream media outlets tend to broadcast meteor events. When Cooke spoke to SPACE.com on Friday (Dec. 7), he was fielding several media calls about a fireball spotted over Texas. Cooke said he welcomes the interest, but also tries to educate those who speak with him. "One of the biggest misconceptions is a lot of people think that the [Geminid] meteor — always the bright ones — will land near them. That's not true," Cooke said. "That's an illusion. It's very rare, exceedingly rare, for a meteorite to land near an individual, and the Geminids won't produce meteorites. They will not make it to the ground. People don't have to worry about getting hit by falling Geminids." Editor's Note: If you take a photo of this year's Geminids that you'd like to share with SPACE.com for a possible story or gallery, please send it, along with your comments, to Mike Wall at mwall-at-space-dot-com.